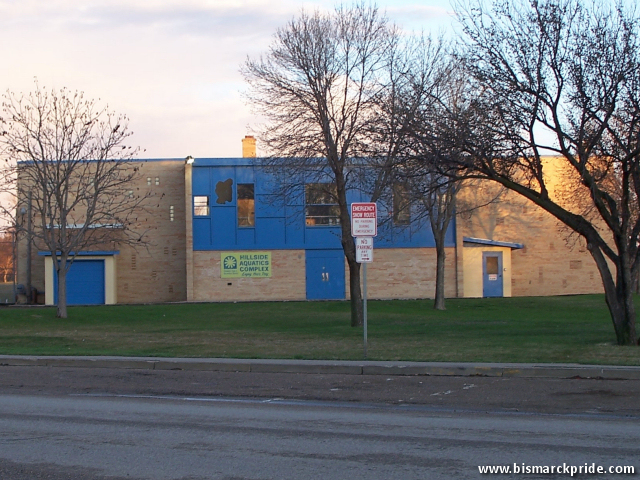 Hillside Park is a park located in northeastern Bismarck south of Boulevard Avenue, just east of Sixteenth Street and directly across from Simle Middle School, which was originally named “Hillside Park Junior High” upon opening. Hillside was named for the Hillside Dairy Company. The park is also known as Lions Park. Hillside Park is home to a playground facility, skateboard park, picnic shelters, and the city’s largest outdoor swimming pool facility. Sand volleyball courts, tennis court, and a Frisbee golf (”Frolf”) course are also located within the park. A hockey rink and adjacent ice skating rink are also present during the winter months. In 2008, the waterslide at the Hillside Park pool will be torn down after nearly twenty four years. The park began a major renovation project in 2009, expected to be completed in 2012. The Ground Round opened its Bismarck location in 1985.